My Marine and a couple of buddies have landed. Thread: My Marine and a couple of buddies have landed. My son was part of a group brought up to Seattle on a ship for Fleet Week. He was able to stop by for a visit for a little while. Wife let them into the man cave before I got home. The guns received a luke warm reception but they went nuts over the khukri & knife accumulation. Buddies were real nice, one from Missouri so it's a given, other was from near us but he was nice too. Nice and polite as you'd expect from a Marine. All due to get out end of the year, my son last in January. All made E4 too, outstanding! 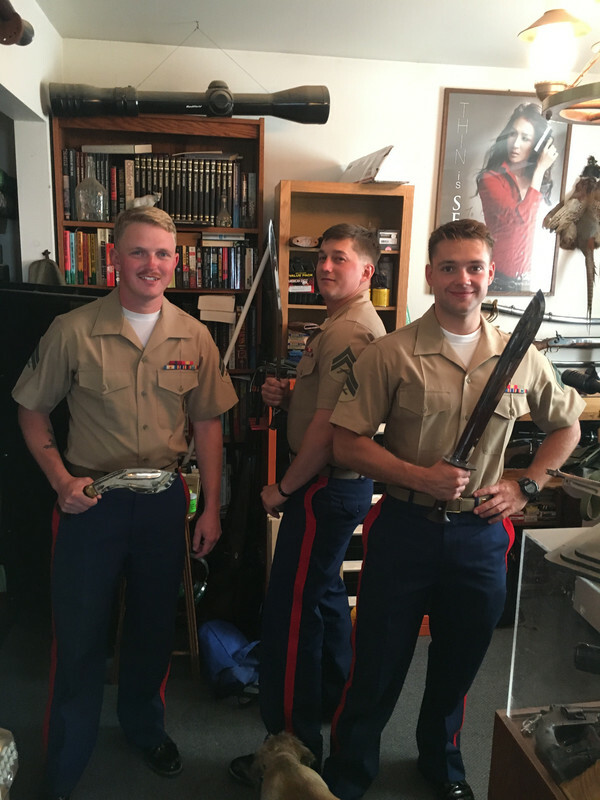 Three, squared away, Corporals of Marines ....with knives.....definitely a man cave! Yup, as we've spoke of before they usually don't wear uniforms while traveling. But part of the deal with coming up for Fleet Week is they have to wear the uniform all the time. My son said they left out the parts about him have to do dishes and serve navy officers. The Navy guys can get overnight passes, these guys tried to get overnight passes to stay at our house since we're close but they were denied. They have to be back on the ship and 2:30 every morning. I guess a few of them have showed up a little tipped over. No surprise I guess. Very cool, you must be proud! Great looking Marines! I would guess they're going to use the GI Bill for college. My nephew graduated May 8th from Embry-Riddle Aeronautical University with a Bachelor of Science in Aviation Maintenance Science and no college debt. He spent 4 years in the USAF and the GI Bill covered all of his education costs... much better than the deal I got... $105 a month in November 1968! That is very cool Colonel. Congrats! Excellent. I thank them for their service. By God and Chesty Puller, that's a fine looking trio of American manhood! It's comforting to know that, in spite of the sensitive metrosexuals we see dominating pop culture, there are real red-blooded young men who are willing to do their all for us and our great country. (them blades ain't so bad either).